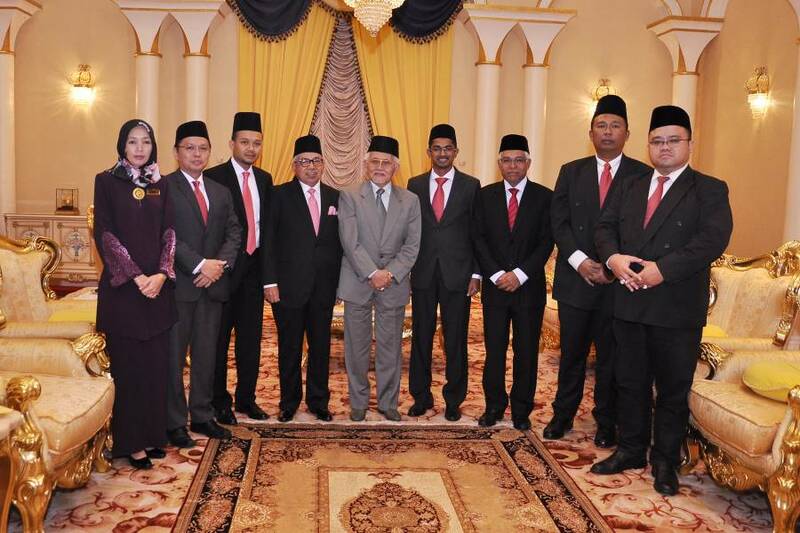 KUCHING, Sarawak, April 16 (Bernama) -- Agrobank’s delegation led by its Chairman, Tan Sri Mohamad Zabidi Zainal paid a courtesy visit on Yang di-Pertua Negeri of Sarawak Tun Pehin Sri Abdul Taib Mahmud at the Astana in Petra Jaya here today. Tuan Syed Alwi Mohamed Sultan, the President / Chief Executive Officer (President/CEO) of Agrobank and other management team joined the delegation. This is part of the working visit to Sarawak by Agrobank’s management team. According to Tuan Syed Alwi Mohamed Sultan, President/CEO of Agrobank, the Bank has a long standing commitment in Sarawak ever since the opening of the first branches of the-then Bank Pertanian Malaysia Bhd in Kuching and Sarikei in 1976. Since then, Agrobank has always been committed to support the development and growth of the agriculture sector in the state. “Currently Agrobank has close to 20,000 customers in Sarawak across the 4 customer segments consisting of corporate, commercial, consumer and micro financing customers. We serve these customers through our network of 13 branches, 5 kiosk, 4 Agro corners, 51 AGROAgent and 33 ATM outlets all over Sarawak. In most towns particularly in Sarawak, Agrobank is the only bank servicing the customers, in line with our financial inclusion commitment which is to serve the unserved and underserved community. Moving forward, we are constantly looking at growing our network of operations in Sarawak,” said Tuan Syed Alwi further. In 2017, there were three (3) significant initiatives in Sarawak, the opening of the first Corporate Centre in Kuching, the launch of micro financing programme called Agro Teras and the MoU with Malaysian Pepper Board (MPB) to benefit pepper smallholders. Agrobank also recently launched a special micro financing scheme called Agro Teras targeting the B40 income group. “We chose Sarawak as the pioneer of this Agro Teras programme as a token of our deeply rooted commitment to Sarawak. As the Agro Teras programme brings together a group of 5 micro entrepreneurs who would mutually share the risks, we now have established 160 groups comprising 800 participants involved in various agriculture entrepreneurship ventures,” said Tuan Syed Alwi. In addition, last year Agrobank also signed an MOU with the Malaysian Pepper Board as part of the initiative to develop financing programme that can benefit more than 30,000 pepper small holders in Malaysia and many of them are in Sarawak. These two initiatives are part of Agrobank’s support and efforts to improve micro entrepreneurs’ socio economic status and build their confidence in expanding their business. “This year Agrobank is working closely with the Regional Corridor Development Authority (RECODA) and the Ministry of Modernisation of Agriculture, Native Land and Regional Development Sarawak to identify viable agriculture and agro-business projects that can redevelop native land and increase its economic value. We hope this efforts will have a positive socio-economic impact in job and wealth creation opportunities for local farmers and agropreneurs in Sarawak and contribute towards exports of our agriculture produce”, explained Tuan Syed Alwi further. Agrobank is a full-fledged Islamic Bank that provides comprehensive financing solutions for agriculture sectors; which includes for upstream activities such as the supply of agriculture production input to downstream activities such as processing and selling agriculture products to consumers. Agrobank is one of Malaysia’s leading banks providing a holistic array of financial services and banking facilities, with focus on agriculture sector. The Bank is a Government-owned Bank under the purview of the Minister of Finance Incorporated. The Bank’s financing of the agricultural sector is driven by a policy set forth by the Ministry of Agriculture and Agro-Based Industry (MOA). With more than 49 years of experience, Agrobank is actively shaping the country’s agricultural development across eight regions it operates, via 188 branches; offering products and services in the areas of corporate, commercial and micro financing as well as trade finance, personal financing, electronic banking and deposit & services. On 1st July 2015, Agrobank has become a full-fledged Islamic bank.